Carolyn Donaldsen (seen wearing silver belt) and other participants prepare for the all-state choir performance on Saturday, Oct. 14 at the Salt Lake Tabernacle. GUNNISON—Four Gunnison Valley High School students recently participated in the annual performance of an all-state choir sponsored by Utah Music Educators Association. 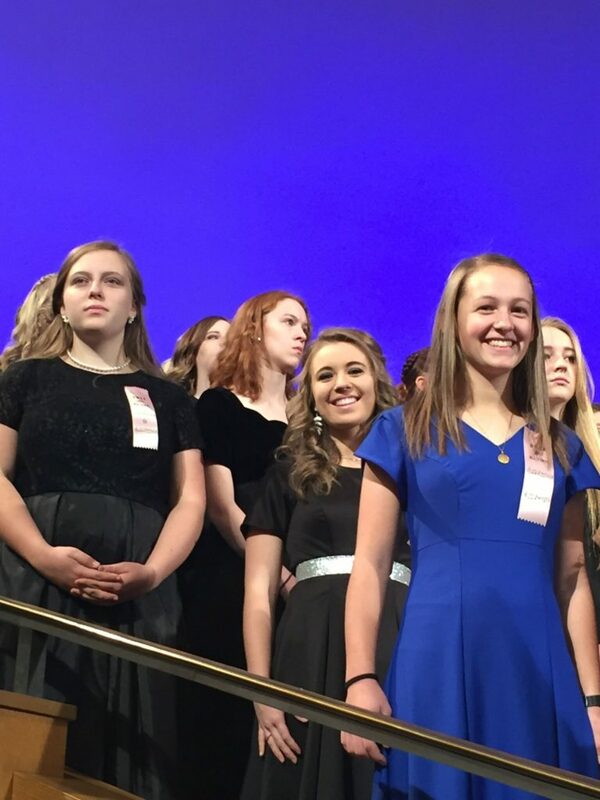 Senior Carolyn Donaldson, juniors McKenna Taylor and Paydenne Mortensen, and sophomore Cora Sanderson joined with about 700 students for a performance on Saturday, Oct. 14 at the Salt Lake Tabernacle. The choir was directed by Dr. Ryan Murphy, the Mormon Tabernacle Choir associate conductor. Students learned their parts at home prior to the performance. Then they practiced for two days at Taylorsville High School. Each year, students from 65 schools are nominated to be part of the all-state choir and participate in the annual performance. All four participants said participating in the all-state choir was a great experience. “I was able to spend dawn to dusk singing with talented teens from all over the state. It’s amazing to add my voice to the chorus of other singers my age who are just as ecstatic to be there as I am, and to improve my ability to perform,” said Carolyn Donaldson, who was participating in the all-state choir for the fifth time. Allred said he chose the four students based on how long they had been with him; whether they fit the voice parts needed; and their dedication, commitment and talent.